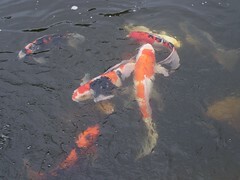 Since 1988, Pan Intercorp has been offering the koi keeping community in North America and beyond, high quality nishikigoi from many of Japan’s top breeders. Tucked away at the north end of Lake Washington in beautiful Washington State, Pan Intercorp’s eight acre facility is home to one of the largest selections of hand picked koi in the country. Not only is Pan Intercorp the sole authorized US importer for Sakai of Hiroshima and Yoshida Fish Farms, we have developed close relationships with a number of noted breeders throughout Japan, giving our clients access to koi varieties and bloodlines that are seldom available outside of Japan. Pan Intercorp koi have taken top honors at shows throughout the US and Canada. In 2008 a koi sold by Pan Intercorp was awarded the most coveted accolade of all… the Grand Champion of the All Japan Combined Koi Show. This marked the first time that an American owned koi had been granted the title Grand Champion of the biggest and most prestigious koi show in the world. Pan Intercorp’s Wholesale Division continues to be the number one choice for retailers looking for a reliable source of competitively priced healthy livestock, while our Retail Division has provided hundreds of Championship Quality Koi to hobbyists both in the United States and abroad. Recognizing that nutrition is a critical factor in developing and maintaining healthy koi, we offer Nozomi koi food direct from Japan. Nozomi is the koi food of choice for Japan’s leading breeders, including Sakai of Hiroshima. With its launch in 1996, Pan Intercorp’s koi.com became the first commercial koi-related website on the Internet. Through the years koi.com has strived to provide the koi keeping community with the highest level of information, service and quality in both koi and koi related products.